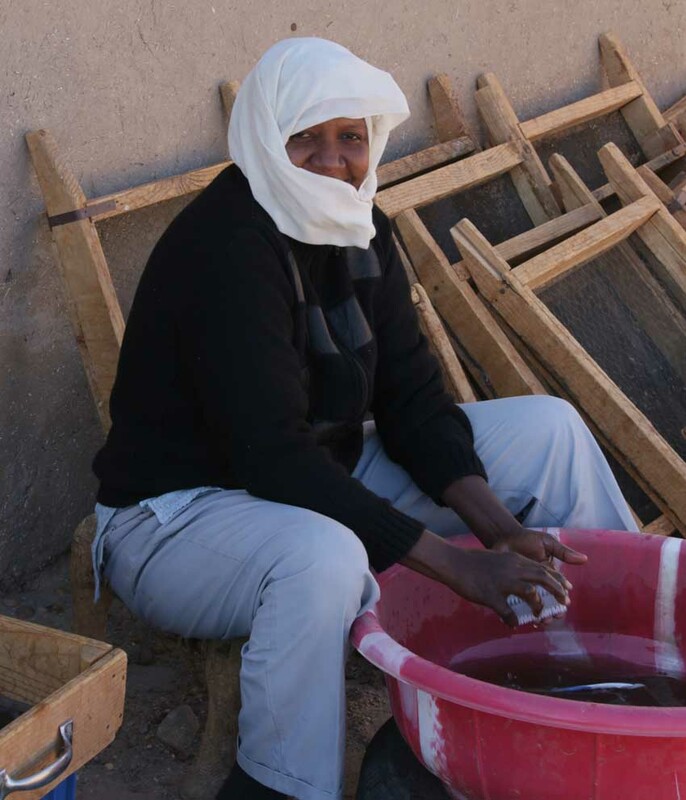 Time is passing by – tomorrow will be the last day of our 2014 field season in t he New Kingdom town of Sai Island; and it was a very fruitful, productive and pleasant season! 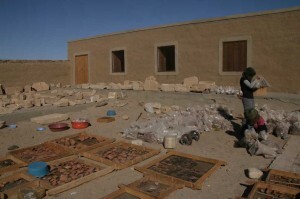 Large amounts of material were unearthed and all working areas provided interesting results. We are currently busy packing the pottery collected as representative samples, washing the last diagnostic sherds and making final drawings of important pieces. The database of small finds from both SAV1 West and SAV1 East now comprises 1732 pieces – and several large boxes of grind stones and pounders are still awaiting registration; one of the first tasks for 2015! The majorities of the finds from the 2014 season are worked stones and re-used pot sherds, but there are also fayence pieces (Nun bowls, beads, one ring) and a lot of clay objects. Some of the latter are nicely identifiable, e.g. rudimentary female figurines and animal figurines, but others are more obscure. 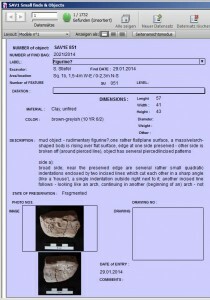 One example is SAV1E 851 – a rather amorphic piece of clay with incised decoration on several sides. Its incised decoration pattern reminds us of the female figurines commonly found in the New Kingdom town of Sai, but its shape is markedly different. 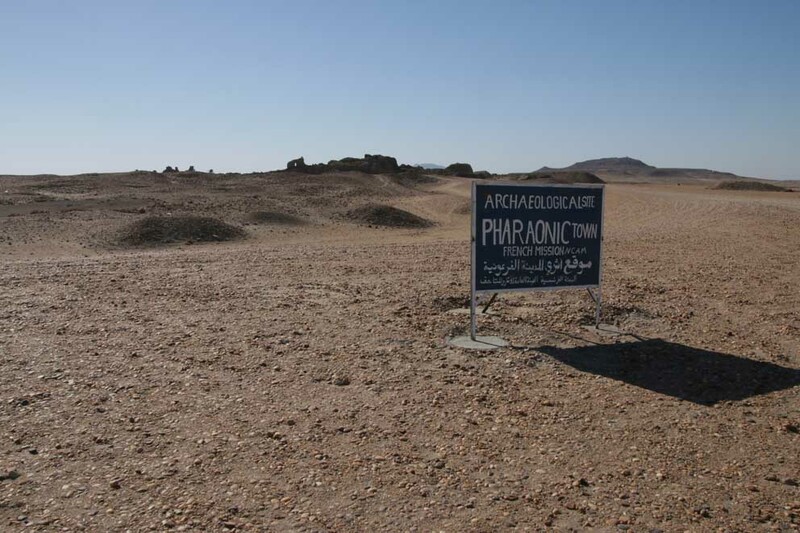 Its context does furthermore not allow a precise dating – it is coming from one of the mixed areas in Square 1B, in the northern area of Building A – ranging in date from the 18th Dynasty up to Christian and Ottoman times. All in all, the finds from this season nicely complement the corpus we already know from sector SAV1 North – and its wide repertoire and remarkable diversity is very promising, processing will keep us busy in the next months! 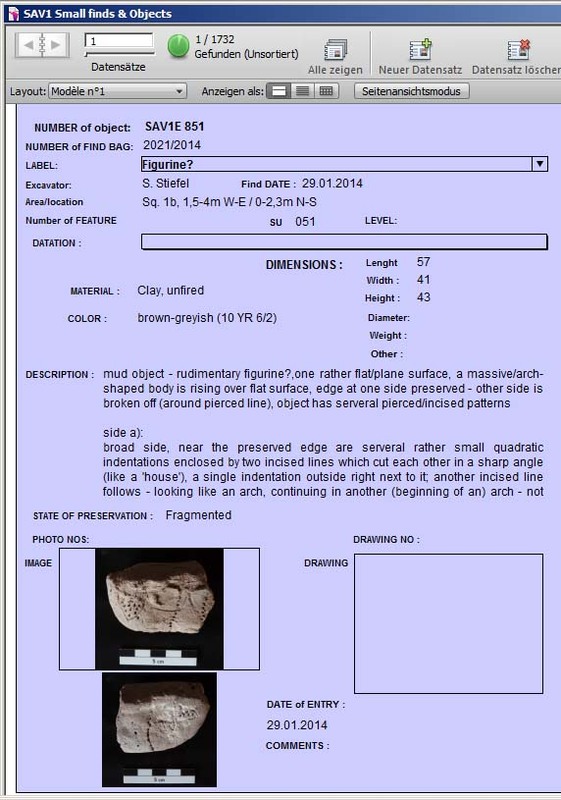 This entry was posted in 18th Dynasty, Archaeology, Fieldwork, Material Culture, New Kingdom, Sai Island, Upper Nubia and tagged Sai Island, SAV1 East, SAV1 North, SAV1 West by Julia Budka. Bookmark the permalink.